Note: There maybe duplication due to cross-posting. Since 2015 Venezuela has endured gruesome economic hardships. Inflation rates have spiraled out of control, and the public is facing a recession that is tearing the country apart. Now, Venezuelans not only face economic turmoil, but also direct military aggression. A sane response of anyone who wishes to help Venezuelans through these troubles is to try to understand why this is happening. Secretary of State Mike Pompeo, taking advantage of political bedlam inside the Donald Trump White House, has busied himself with “regime change” in Venezuela. Pompeo, working with National Security Adviser John Bolton and Iran-contra felon and arch-neo-conservative Elliott Abrams, worked secretly with Venezuela’s self-proclaimed “interim president,” Juan Guaido, to overthrow that nation’s duly-elected president, Nicolas Maduro. Welcome to a new era and a new format for The Electronic Intifada Podcast! Joining Nora Barrows-Friedman as co-host for the first time is her colleague and fellow reporter Asa Winstanley. This week we take a deeper look at Asa’s latest investigative article, “Fake Labour accounts fueling ‘anti-Semitism crisis’,” which went viral soon after publication. We discuss how the story came about and the wider background of events in the UK Labour Party over the last few years. Who is behind the “anti-Semitism crisis” in Labour? Is this media narrative having an effect? How is Israel like ISIS? Has there been any official response to the story? What would Asa say to Jeremy Corbyn if he had another chance to interview him? And why do people who try to ban the term “Israel lobby” annoy the hell out of us? Donald Trump is simply exercising an imperial mandate handed down to him by Obama, who put “humanitarian” lipstick on the white supremacist pig of American exceptionalism. 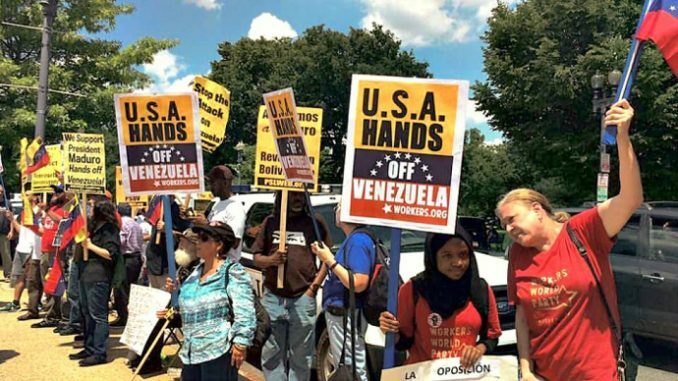 Trump’s attempt to overthrow the Venezuelan government has been joined by fellow fascists around the world, including most of the Democratic Party.